The style is bright, clean, & beautiful. I just don’t know that I’d spend that much money on something that could easily be pooped, peed, or barfed on. 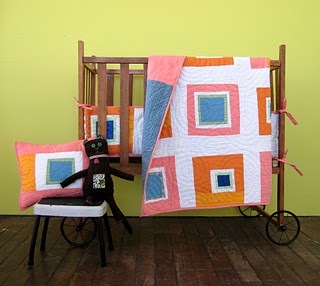 I LOVE Denyse Schmidt quilts too. Have you seen her more affordable line Denyse Schmidt for Sarita Handa? Or something like that….I blogged about it a few months ago so you can google it if you want. I’m not sure you sent me an email about the swap but I’d LOVE to have you join in. Your blog is cute. I bookmarked it and am happy to have discovered you! 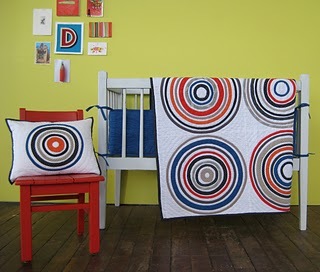 love love love the circles!